The VWR 4°C Chromatography Refrigerator provides you with 29 cubic feet of well lit, easy visible use for your chromatography applications. This 4°C refrigerator has a single, lockable glass door, a directional airflow system and an ample interior out fitted with adjustable shelving, a vapor proof duplex outlet, and two covered access ports for instrumentation. This chromatography fridge has a temperature range of 1 to 8°C (34 to 46°F), and has an extra strength, 1/3 hp, evaporating, industrial compressor. To monitor temperatures, this lab refrigerator features an electronic thermometer with digital display, that allows users to make changes as needed. 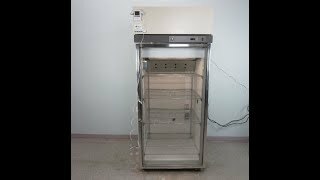 This VWR 4°C Chromatography Refrigerator has been fully inspected and comes with current temperature validation. Please note there is a cosmetic blemish at the top corner of the refrigerator, pictured, it does not impact performance in any way. All of our lab equipment comes backed with our standard warranty. Should you have any questions, please don't hesitate to contact us.